It is a common idea in some circles that if women ran the world, there would be no war. This is an old idea. Studies and history have shown it to be utterly false -- we in our Neptunian Age of Pisces do love our myths. Today's study is of the charts of the "three witches" who drove the US invasion of Libya in 2011. As we would expect, the charts show authoritarian and even violent tendencies. This study is apropos, given the propaganda drumbeat today for a new war against Syria. 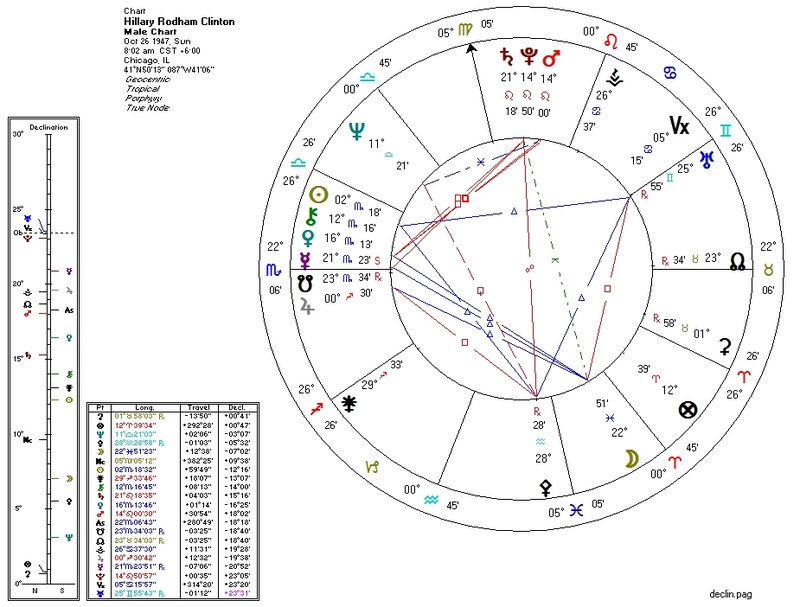 Hillary Rodham Clinton, a most bloodthirsty lady and probably the next US President, has a single libertarian chart feature: Pallas trine Sun. This is easily overwhelmed by all the authoritarian aspects: Pallas is square Jupiter, quindecile Pluto, and co-ruled by Uranus which is parallel Pluto. Putting her very solidly on the economic Left is the South Node conjunct both Venus and the Second House ruler Jupiter. Putting her on the cultural Left is the South Node trine the Moon in Pisces. 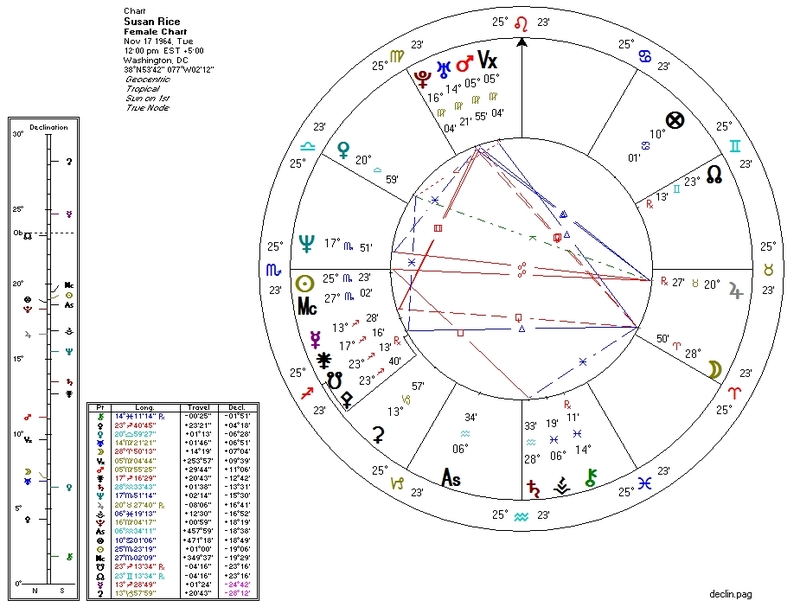 Completing the Bloodbath Formula for mass-murder charts is Pluto ruling and tightly mundane-square the Sun, quincunx Moon via conjunction with Saturn, and ruling and square Venus. UN ambassador Susan Rice, like Clinton, has a single libertarian chart feature (in this case Jupiter, ruler of Pallas, opposite Sun). This same Jupiter is also trine Pluto, however, and Pallas herself is tightly conjunct the life-draining South Node. This is consistent with a personality with a desire to wage war. 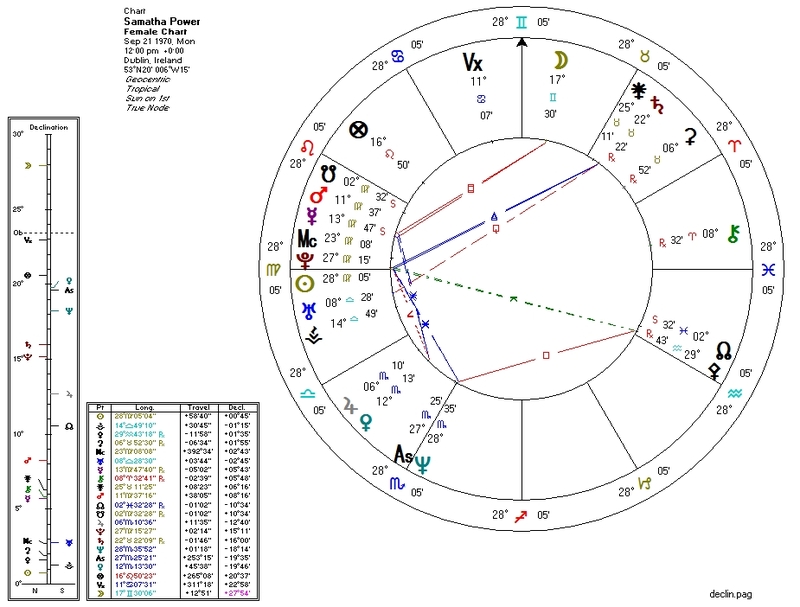 Interestingly, she as a North Node trine to Venus which suggests she might be comfortable in a Republican administration. Depending on time of birth, she probably has the culturally-liberal South Node trine Moon. Samantha Power, war cheerleader and probable future UN ambassador, has a chart that is less authoritarian-looking than her sisters of the sword. Her Sun is quincunx Pallas and trine Saturn, co-ruler of Pallas; Pallas herself is conjunct the North Node. Counterbalancing all of this is Pluto conjunct her Sun and sextile Neptune, co-ruler of the North Node. Her Venus is co-ruled by Pluto, which in sextile to Neptune suggests a Leftward economic lean. While her Pallas is not as compromised as those of her fellow queens of death, Power has Pluto in aspect to both Sun and Venus. As per the Bloodbath Formula, these aspects seem to make one more likely to get one's hands dirty. Interestingly, all three women have Mars in various states of conjunction with Pluto.